“My father was an early supporter of the The Arden Craft Shop Museum, Inc when it opened, so I made a bequest in my will for a percentage of my estate to the ACSM as a legacy gift in his memory.” ~S.S. Making a Legacy gift is a simple process that may provide you with significant tax advantages. Consult with your financial advisor to get more information to your own financial situation. Your donation, of any size, provides an important foundation for the education, and discovery that takes place the Arden Craft Shop Museum, Inc. while it also aids in keeping the museum and its collections, exhibitions and programming open and accessible for future generations. A charitable bequest is simply a distribution from your estate to a charitable organization through your last will and testament. With a bequest in your will, you can give a percentage of your estate, so that your gift will remain proportionate to the size of your estate, or you can give a specific amount. 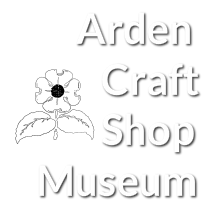 In either case, your gift allows you to retain full control of your assets now, while ensuring that the Arden Craft Shop Museum, Inc. will continue fulfilling its mission; to preserve, restore, catalog, display, and interpret the history of the three Ardens. A charitable bequest is deductible for federal estate tax purposes. Bequests are generally not subject to state inheritance or estate taxes. Including the Arden Craft Shop Museum, Inc. in your will, may also allow you to make a more significant gift to the institution than would otherwise be possible during your lifetime. A bequest may be made directly in a will, or a codicil may be added so you do not need to rewrite your will. To make a bequest, consult with your attorney to include language that directs your assets to the Arden Craft Shop Museum, Inc.
​Be sure to consult our attorney for assistance. IRAs and qualified plans like 401k are some of the best assets to leave to a non- profit organization. Retirement accounts can be among the highest taxed assets in any estate. Consider a tax-saving strategy by naming Arden Craft Shop Museum, Inc. as a beneficiary of all or part of your retirement plan assets reserving other, less-taxed assets for your heirs. Because of our tax-exempt status, income and estate taxes are eliminated, allowing the full value of your retirement plan assets to make a difference in keeping and preserving the history of the three Ardens. Increasing the impact of your bequest. the Arden Craft Shop Museum, Inc will not have to pay income taxes on your donation when it receives assets from your retirement account. Decrease the estate tax burden for your family. Your assets would pass directly to the Arden Craft Shop Museum, Inc, so your estate would be eligible for a federal estate tax charitable deduction on the account’s value. Contact your retirement plan administrator for a simple change-of-beneficiary form. Decide what part or percentage (%) of your plan assets you would like the Arden Craft Shop Museum, Inc. to receive. Name the Arden Craft Shop Museum, Inc. and list the gift amount or percentage of the gift on the form. Contact us to let us know of your plan so we can recognize you for your meaningful gift. Note: Check with your plan administrator to determine if you can use your plan on-line account to change beneficiaries. All notifications are confidential. The purpose of this page is to provide information of general character only; the Arden Craft Shop Museum, Inc. is not engaged in rendering legal or tax advisory service. Advice from legal and tax counsel should be sought when considering these types of gifts. As always, we recommend that you consult with your financial advisor or attorney to ensure that all your objectives are met, as gifts have varying benefits depending on if they are made outright during life or through a bequest.